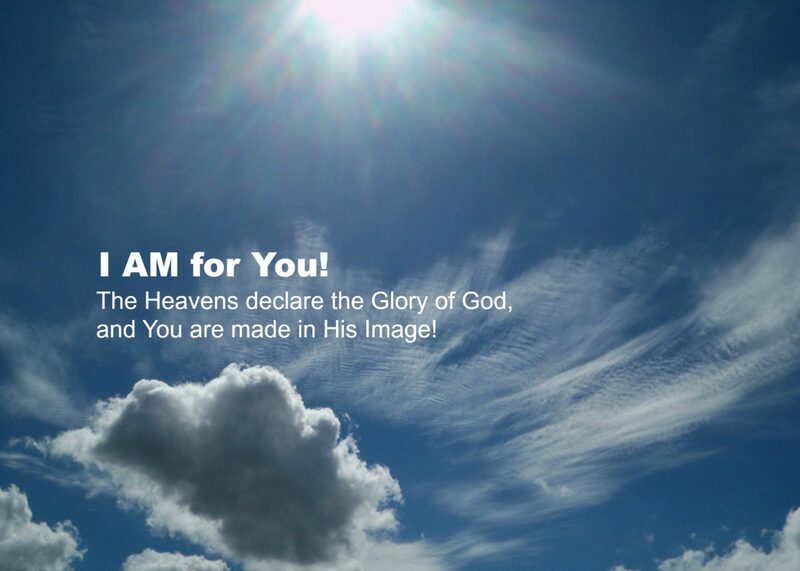 God – Page 2 – I AM for You! God cares about the smallest details of our lives. That is the character of Jesus. He cares so much about you that He decided He would rather die than spend eternity without you. And now it’s your turn to decide if you want to spend eternity with Him. He will not force you, He’s a gentleman, and only goes where He’s invited. He offers eternal life, right now, not just after you die. And you don’t have to be perfect, that’s His work, to make you like Himself. You do have to choose, as He makes you able, to not sin anymore. But if you do sin again, He is faithful and forgives you and helps you through the consequences of sin. He will also challenge you to discover that His way is better than any sin. When you choose to obey Him, He will give you real life, real joy, real meaning, real satisfaction. You will discover that satan’s way has never ultimately satisfied you like Jesus’ way. Jesus is with you right now. He can give you the power to change. All you have to do is ask Him, and let Him give you the power to obey Him. Satan is appealing to my pride again. He is telling me (not in words, but in thoughts and feelings) that I KNOW SO MUCH ABOUT GOD that I don’t need to learn from other people (which God says in Proverbs clearly that I do need to learn from others). I identified this feeling when in a Christian bookstore reading the covers of some books. I decided to buy the book I was looking at (and my feelings were telling me that I didn’t need to read it). Then I told my wife what I was going through. I have started reading the book (All In: You are one decision away from a totally different life by Mark Batterson) and it is very good and I am learning alot and being motivated alot (which satan didn’t want). By telling my wife about my struggle, the sin of pride is not in the dark anymore, where it can grow and destroy me. Instead, it is in the light which exposes its true malicious intent. I experience world-class feelings of insecurity and inferiority sometimes. Satan used my God-given need to feel the value God has given us, against me. However, detecting satan can be so difficult sometimes. He can be so subtle and appeals to our God-given needs (but he wants us to meet those needs outside of God’s will). But by following Jesus I (and you) can defeat satan. It has been said that to learn how to recognize counterfeit money you have get to know the real thing better. It has also been said that to learn how to recognize satan, get to know Jesus better. Some television pastors that I highly respect believe that mental illness, including depression, can be best treated without medication. While some depression can be treated by developing a better relationship with Jesus, and some can be treated by learning better thinking patterns, and still others can be treated by having a healthier body and lifestyle; I believe some mental illness requires medication, as well as these other treatments. At the early onset of depression, medication (SSRIs) can arrest a downward spiral. This can give the person an opportunity to develop a better relationship with Jesus, to learn and apply more effective thinking patterns, and to gain the benefits of a healthier body and lifestyle. By acquiring new skills a person may be able to manage their situation better, and may be able to get off the meds relatively soon. By waiting to take meds, or not take them at all, as some pastors suggest, permanent damage to the brain can occur and the person can then need the medication for life. (Not to mention that the person could become so ill without medication they could even take their own life). The brain is a physical organ of the body. It is the interface between our mind and the physical world. As an organ of the body it is subject to disease just as the other organs of the body are subject to disease. Just as bone marrow produces blood and the pancreas produces bile, the brain produces, among other things, thoughts. Disease interferes with the correct production of these thoughts. That is, many times these diseases interfere with the electro-chemical interactions of the brain that produce correct thinking. These electro-chemical interactions can sometimes be corrected by medication. Serotonin is a naturally occurring chemical in the brain that helps us to naturally “feel good”. If the serotonin the brain is producing is insufficient, depression can result. SSRIs (Selective Serotonin Re-uptake Inhibitors) are used to cause the brain to recycle its own limited supply of serotonin. It is still your own serotonin; it is just reused over and over instead of being used up the first time. Some may say, “God can heal depression.” And to that I say, “Absolutely!” God has the power to miraculously heal depression, all mental illness, and all illnesses – without the use of doctors or medicine. But why does the Bible not condemn Luke for being a doctor? And why did the Apostle Paul say to Timothy, “Have a little wine for your stomach’s sake?” Is intervention – by people and medicine – to heal the body (and the brain is part of the body) universally condemned by all of Scripture? As Jesus said, “Let’s judge by true standards!” Do you use glasses to correct your vision? Would you say, “My lack of vision is caused by a lack of faith in Jesus to heal me, I am going to have faith and drive without glasses now.” Would you say to a person dealing with diabetes, “Your poor diet and lack of exercise has caused this, repent, stop taking your medication, and trust Jesus to heal you?” Would you have surgery without anesthesia because anesthesia affects the brain? Have you ever taken an aspirin? Have you ever had a cup of coffee? Jesus felt healing people’s suffering was more important than rules. Jesus gave the example of David, on the run and hungry, asking the priests for the show bread; which only the priests could legally eat according to God’s Law. The priests gave it to him and he and his men ate it, in direct violation of Scripture. Jesus said that all “rules” must be derived from “Love God, love people.” I believe God allows the use of meds to help the brain and so help people not to suffer, to reclaim their thinking, and to recover. The real issue here, I believe, may not be medical intervention of brain disease. The real issues may be fear; and perceived failure and its consequences. Fear, in that the people who say not to use meds for brain disease may feel that if someone else’s brain can inexplicably not work correctly, then maybe the same thing could happen to them. And they may be scared to death that they could “lose their mind” too. They may not understand or trust medication and so be afraid of it. They may be more comfortable “trusting God” and doing nothing, than trusting God and using the tools He has provided (developing a relationship with Jesus, developing thinking skills, developing a healthy body and lifestyle, and medication). Perceived failure and its consequences may also be the real issue. The person who does not believe God uses meds for the brain may feel that the person who is depressed has “failed” to have “faith”, or has “sinned” and so must not be “drugged” to insulate them from the pain they need to feel in order to be motivated to “get right with God.” Job’s experience with his “friends” teaches us that our response to suffering needs to be compassion, and sharing the burden; not judgment based on our wrong assumptions of “God’s ways”. If you know someone who is struggling, you can be a light in a very dark world. You can offer compassion and hope to them by affirming to them that God is for them and so are you. You can encourage them that one in five people will deal with a mental illness in their lifetime and that recovery is now the expectation instead of the exception. And, if they are prescribed medication, (and that medication may have to be changed before the right one is found), you can assure them that Jesus uses medication to help the brain function just as he uses medication to help other parts of the body to function. 1If I speak with human eloquence and angelic ecstasy but don’t love, I’m nothing but the creaking of a rusty gate. 2If I speak God’s Word with power, revealing all his mysteries and making everything plain as day, and if I have faith that says to a mountain, “Jump,” and it jumps, but I don’t love, I’m nothing. 3If I give everything I own to the poor and even go to the stake to be burned as a martyr, but I don’t love, I’ve gotten nowhere. So, no matter what I say, what I believe, and what I do, I’m bankrupt without love. 8Love never dies. Inspired speech will be over some day; praying in tongues will end; understanding will reach its limit. 9We know only a portion of the truth, and what we say about God is always incomplete. 10But when the Complete arrives, our incompletes will be canceled. This is what Love is like. This is what God is like. And this is what Jesus is like. He never gives up on us, He’s always looking for the best in us, He doesn’t keep a sin scorecard (our sins are wiped away when we trust Him that He paid the penalty for them), He doesn’t think He’s better than us, He’s not stuck up, He doesn’t force Himself on us, He doesn’t have to be first, He cares more about us than His own life. This is one amazing Jesus. Author james bruce mcnaughtonPosted on April 20, 2014 Categories glory, God, grace, http://schemas.google.com/blogger/2008/kind#post, Jesus, love, sin, truth, understandingLeave a comment on What is Jesus like?